Welcome to Koha Yoga and Abundelicious Unwind & Awaken Retreat featuring Acro Yoga, Holistic Nutrition, Paddleboarding and the immense beauty that is Costa Rica. 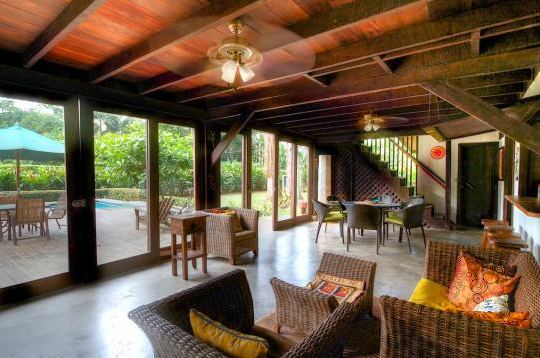 We will be tucked away in a private house with a pool in Punta Uva, which is located on the Caribbean coast of Costa Rica. Here your home will be steps away from the most beautiful beaches and the best organic food in Costa Rica has to offer. You don't have to be a yogi, or someone who knows how to stand up paddle board. Come as you are, someone who wants to have fun in the sun, experience something new and go on an adventure. Breakfast, lunch and dinner will be served by Abundelicious (vegan & gluten free options available). Our retreat menu features highly nutritious meals full of local, raw and organic ingredients that thrive abundantly in Costa Rica! Here is an example of an average day on the Awaken & Unwind Retreat. Please keep in mind that everything is optional. If you'd prefer to sleep in and forgo the morning yoga or if you'd only like to spend the afternoon relaxing on the beach you are more than welcome. This trip is all about you and what you want out of it, so you can adventure as much or as little as you desire. 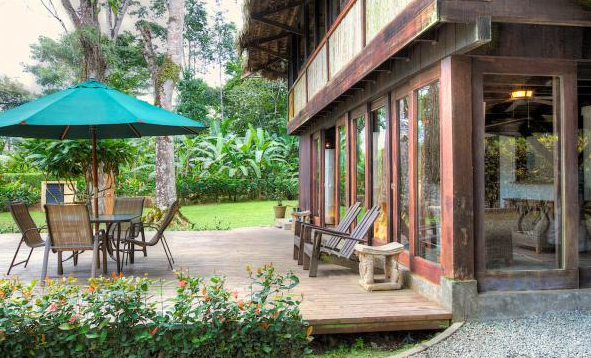 This is your chance to Unwind & Awaken in the lush jungle of Costa Rica then return home feeling refreshed and inspired. This trip gives you the ultimate blend of wilderness exposure and excitement. Rio Pacuare is work famous for its pristine beauty. The wildlife is abundant with sloths, toucans, parrots, coatis, butterflies and much more.” 4 hours 30kms/18 miles, 38 rapids, minimum age 12 years. Experience this magical tour along the Punta Uva coast, an ideal time to learn about animals and the different species of plants that we see along the way. A unique experience to interact with wild animals from Costa Rica, supporting a good cause.The Jaguar Rescue Center, located in Puerto Viejo, Limón (Costa Rica), is a non-profit Organization, that works on rescue and rehabilitation of wild animals, and its future release to the wild, always in protected areas. You can come and visit them, during the retreat, public tours are around $18 and private tours are around $50USD. We will be staying in a traditional 4 bedroom Caribbean House with swimming pool in an excellent location near the beautiful beaches of Punta Uva. Each bedroom has a ceiling fan, comfortable beds, sheets, pillows, towels, and gorgeous jungle views! There are hammocks for napping plus open air sitting areas for reading or writing. There is a wooden balcony perfect for lounging in the sunshine, practicing yoga or just relaxing by the pool (yes, there's a pool)! Filtered water, tea, coffee, breakfast, lunch and dinner are included each day of the retreat but there is a kitchen available to make snacks or to store perishable food. A washer and dryer for laundry is also available. The other half of the retreat will be in a house next to the pool house property. It is the exact same Caribbean House without a pool. Please do not hesitate to ask for more details or if you have more specific needs, we can accommodate you, no problem. There are limited spots on this trip. A non-refundable $250 deposit secures your place on this retreat. Please book early to secure preferred type of occupancy. Early Bird prices now until OCTOBER 1st, 2015! $899 ($988 reg. )Bunk beds with 4 people per room, shared bathroom (1 SPOT). $999 ($1099 reg.) Double occupancy room one queen sized bed, shared bathroom (SOLD OUT. $1099 ($1208 reg) Double occupancy room one queen sized bed, private bathroom (SOLD OUT). $1199 ($1318 reg) Single occupancy room with a double bed, shared bathroom (SOLD OUT). $1299 ($1428) Single occupancy room with one queen sized bed, private bathroom (SOLD OUT). Accommodations: Each bedroom has a ceiling fan, beds with comfortable mattresses, towels and sheets. The deposit is non-refundable. The full balance is due 8 weeks prior to the retreat date. Cancellations prior to 8 weeks will receive a refund of monies paid, less the $250 deposit. Cancellations within 8 weeks of retreat date will receive a refund of monies paid, less the $250 deposit only if we can fill your space. If your space cannot be filled, no refund will be given. We may change or cancel any service without reimbursement for reasons beyond its control, such as: strikes, weather conditions, war or local guerrillas, public demonstrations, natural disasters or acts of terrorism, schedules changes, ocean conditions or acts of God (aka Volcanic Eruptions). It is best if you buy vacation insurance to protect you from unforeseen events.